European Poker player of the Year 2007, Dave Ulliott, or ‘Devilfish’ as he is more commonly known, is Britain (and mainland Europe’s) most famous and successful poker player. From a tough childhood in Hull, Ulliott’s journey has seen him spend time as a boxer, a bouncer, a safe-cracker, pawn broker and a gambler before becoming one of the world’s most successful and recognisable professional poker players, and with winnings of over £5million. He was ranked no.9 in Poker Player Magazine's Top 10 Poker Legends List. He was the inaugural winner of Channel 4’s Late Night Poker, the programme now credited with being the catalyst for the current global poker boom, and he has played and won tourn- aments in London, Las Vegas, Mississippi, Paris and Vienna. backstreet games, he can now find himself at an invitation only, high-roller competition in Vegas playing with Hollywood’s poker fraternity, Jennifer Tilly, Matt Damon, James Woods and Ben Affleck. Ulliott’s fame as a gambler in the UK is such that he is even name checked on Eastenders, and his charismatic table image as the archetypal, aggressive poker player was one of the deciding factors in the re-commissioning of Late Night Poker. Banned from every British bookies because of his betting success, Ulliott is now in the rarefied stratosphere of bona fide poker royalty. 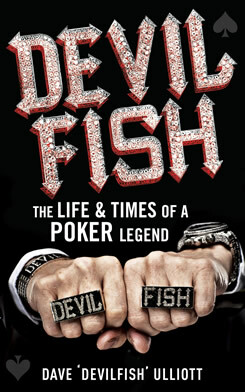 As poker commentator Jesse May recently asked, ‘How, as mere mortals, can we play like the Devilfish! 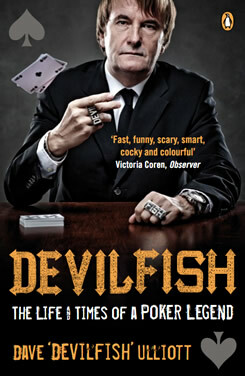 ?‘ In 2006, Dave Ulliott was the central focus of a successful biography of the British poker scene, Swimming With the Devilfish, and he is currently working on his autobiography.